This backpack buddy lets a friend lend a robotic hand using VR! #WearableWednesday « Adafruit Industries – Makers, hackers, artists, designers and engineers! robotic engineer yamen saraij has developed a pair of robotic arms that can be worn like a backpack and controlled using virtual reality controllers. equipped with two cameras attached to the top of the backpack, a remote user can visualise what the person wearing the backpack is seeing, controlling the spare limbs with the help of an oculus rift VR headset. the remote user can wield handheld controllers to direct the non-human arms and connected hands. saraiji, an assistant professor at tokyo-based keio university’s graduate school of media design, led the development of the project, called fusion, to explore how people may be able to work together to control, or augment, one person’s body. using different buttons on the oculus rift controllers enables different finger functions. the operator can move the various fingers on the robotic hand simultaneously. as well as hugging, high-fiving and giving the occassional neck rub, the robotic arms can be used to pick things up. 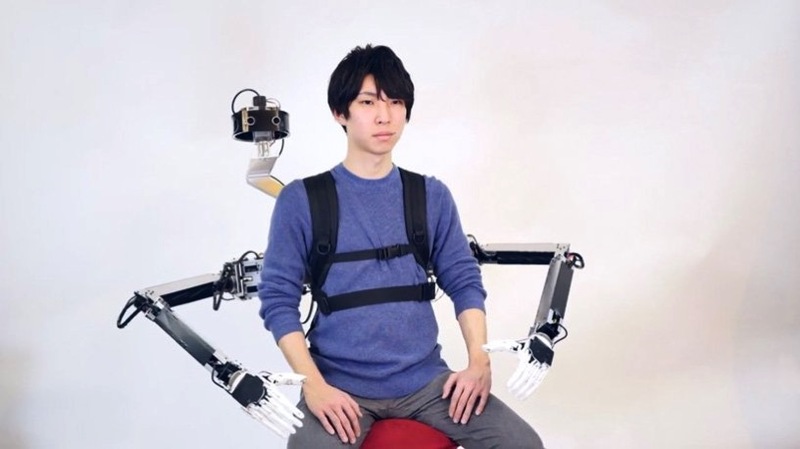 alternatively, the mechanical hands can be removed and replaced with straps that go around the wrists of the person wearing the backpack to give the remote user full control of their arms.